Continuing the science fiction resolution, I've decided to dive into The War of the Worlds by the great H.G. Wells. Several flares fire from the surface of Mars. The scientific community is abuzz with theories. Then, out side the town of Woking in Surrey, a meteorite crashes. Men observe a silver capsule and the end is slowly unscrewing. Assuming there must be men inside, many people gather around, but what emerges isn't a man. 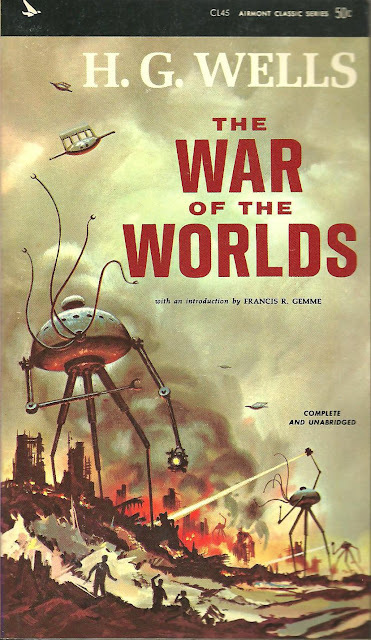 The martians incinerate most of the onlookers with a heat-ray and our narrator barely escapes. 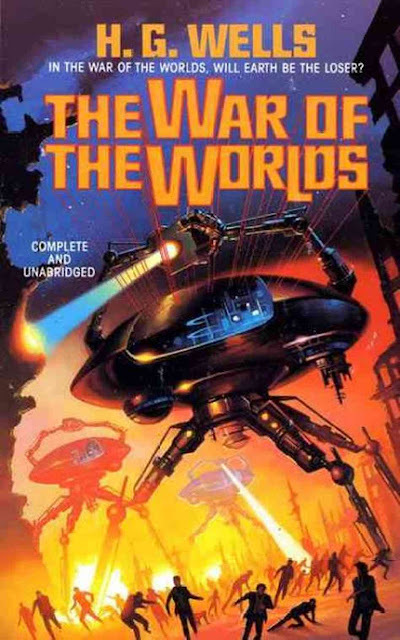 The War of the Worlds is a claustrophobic first hand account of a martian invasion of earth.We follow an unnamed narrator who is privy to the main events of the martian invasion of Earth. We also get occasional bits of his brother's story about London falling to pieces. The Narrator is fairly nondescript upper class married Britisher. He's a sort of everyman, but the focus is really on humanity's experiences. The Narrator's brother falls into the same roll. In fact there are no named characters in the novel. As the social systems break down, humanity falls into chaos. Most of the passersby that they meet are half crazed. People even die simply from all the chaos. The curious exception is a pair of ladies who meet the brother. An interestingly feminist move from Wells. The Artilleryman is a running character who represents kind of dreamlike vision of resistance. His section at the end came across as almost more pessimistic than the scenes with the curate. The curate is a deranged man of God who seeks the aide of our narrator. His weak will nearly spells the death of them both. "Surely, if we have learned nothing else, this war has taught us pity--pity for those witless souls that suffer our dominion." The Martians emerge from their capsules as hideous chinless tentacle beasts that quickly construct massive weapons of war. Their tripods have heat rays and writing tenacle arms. They are nearly invulnerable to harm. When artillery kills one, the Martians devise poison gas grenades that decimate populations. They are an awesomely terrifying foe that is just short of invincible, but their true terror lies in their intelligence and their choice of meal. 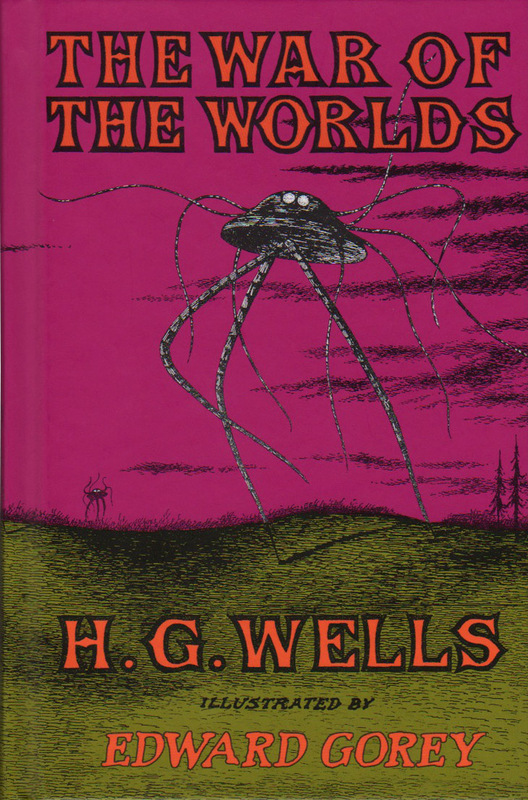 Though Wells can go overboard on the details and his prose can be a bit dated, this novel has some of the most epic and gripping descriptions. The opening chapter of this book is one of the great science fiction openings of all time. The classic ending of a science fiction masterpiece. If you don't know the end, read a freakin' book! I absolutely love the ending and especially how it is foreshadowed at the start. The epilogue leave a sobering tone about the toll a traumatic experience can leave on the human mind. After the grim sections of the novel it is kind of incredible that it has a positive ending at all. Despite some anachronistic language and long passages, this novel is a timeless classic. The martians are a vicious and calculating enemy. If, for some reason, you haven't read it, do! Get it free from Project Gutenberg or Amazon! Tomorrow, I add my first non-Doctor Who audio. Guess what it is!